Courtesy of Coldwell Banker AJS (Casc), Pat Vredevoogd Combs. Thornapple River Frontage! Never before on the market. Built in 2011, this craftsman style home with beautiful wood finishes is seamlessly integrated into a natural setting of woods, streams and river frontage.Custom designed by Cox built by Stoepker with all the finest materials and a unique floor plan taking advantage of stunning River views. Features include solid cherry cabinets, solid wood 6 panel doors, soaring entryway, granite counter tops, hickory floors in the great room and kitchen, main floor master suite, sun room, 4 bedrooms, 4 stall heated garages, family room with wet bar, huge pantry. Use your imagination with an office on the main floor connected to a 2 story music room(12” thick walls – 19′ ceiling). Currently used as an organ room – there are many possible uses: think Yoga Studio! Basketball Court! Music Practice Room! just to name a few. 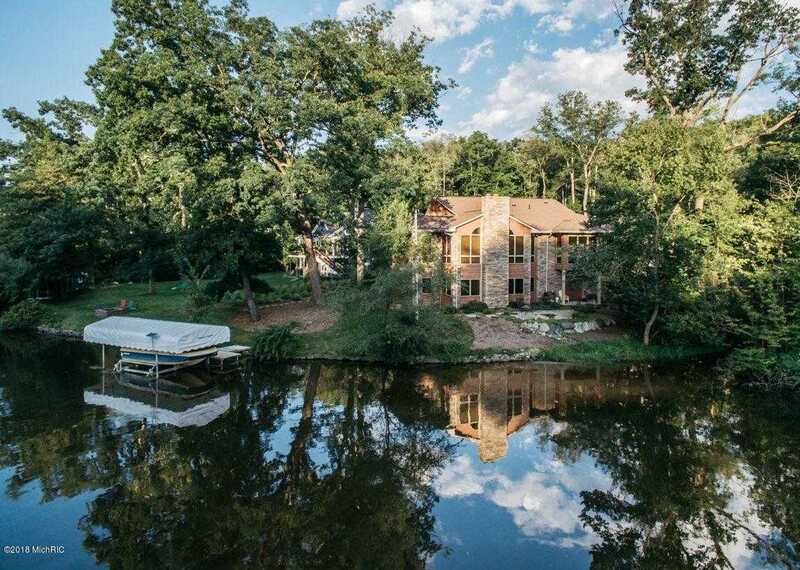 Other extras: automatic all house generator, boat dock, boat lift, boat, all house sound system, fire pit, kitchen with stainless appliances including warming drawer,wildflower gardens, solar tubes, mulberry flooring in office, cork flooring in lower level bedroom. Fantastic setting with a stream meandering alongside the home leading to River frontage. Enjoy boating during the day and a fire around the firepit in the evening. Directions: East off Cascade Road on Cascade Springs – follow the road to the end.